Step by step information to make the transition. 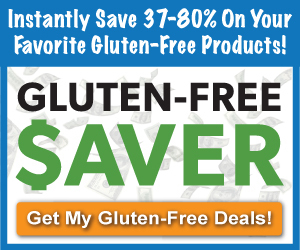 Resources, tips, and guidance from our gluten free home to yours. Do I need to make my entire kitchen Gluten Free? Most likely, similar to my family, only one or two of your family members eat gluten free. In our family, my oldest daughter was initially diagnosed with celiac disease and I went gluten free shortly after that. For a few years, we were the only two members of our family that were gluten free and so we had a shared gluten and non-gluten free kitchen. If you have a shared kitchen, set up a dedicated gluten free area in your kitchen or pantry where you can put your gluten free toaster and products. Clearly label these areas and make sure they are above any areas that have wheat items. You do not want the crumbs from your wheat crackers to contaminate your GF area. Make a rule that nothing with gluten in it ever touches the counter in the GF area of the kitchen. Dedicate the top shelves in your refrigerator as gluten free and clearly label it as your “gluten free only” area. Keep separate and label all gluten free spreads, butters, and condiments. You do not want someone sticking a knife that has run over a piece of wheat toast in your GF butter dish. Buy a dedicated GF toaster, cutting boards, strainers, wood spoons, and any other porous items that could trap gluten and clearly label them GF. Buy dedicated cleaning sponges and scrub brushes for your GF areas and items. Clearly label all of your dedicated GF appliances etc. Having these areas clearly labeled makes it easier on baby sitters, sometimes spouses and any company that you have over. Going GF all of the way. Eventually, after more than half of my family went gluten free and more gluten free products became available, we decided it would just be easier if our entire kitchen became GF. This eliminated the cross-contamination issues in our kitchen. We now just have one toaster, one jar of jam, one container of butter etc. I think it actually means a lot to my GF kids to have a safe GF environment at home. No matter how good of a show the child puts on, it can be hurtful when other people eat gluten around them. Our kitchen is a safe haven where they don't feel constantly deprived and where they can eat anything in the refrigerator and pantry without worry. Lastly, having a dedicated gluten free kitchen is easier in the end. I just cook one meal for dinner and everyone is happy. Once you have a good idea of what gluten is, you need to go through your refrigerator, pantry, your medicine cabinet and your cosmetics and either get ride of everything that is not GF or clearly label it as not GF for someone else in the family to use. Even if your butter and jam is GF, in the beginning you will need to buy new-dedicated GF containers of the same. You do not want to eat butter that may have been contaminated with a knife with gluten on it. The same may be true for sugar as well if someone dipped a measuring cup with wheat flour into the sugar jar. Nonstick pots and pans - can harbor gluten in scratches. Plastic bowls - same reason that scratches can trap gluten. Grills - a lot of marinades contain soy sauce that is made with wheat. You may be able to bake off the residue, but I like being extra safe. Cookie sheets - a good scrubbing may get any former gluten residue off but I was a little too paranoid to use my old cookie sheets for my now gluten free cookies. If cost is an issue, you can use parchment paper on old cookie sheets. I would replace silicon baking sheets and muffin tins that have been used with gluten products. Cleaning sponges or scrub brushes – you don’t want to clean your GF dishes etc. with a scrub brush that has been contaminated with gluten. Wooden rolling pins and flour sifters. Any other porous items such as iron pans. After you have sorted through the food items and appliances, this is a good time to give everything in your kitchen a good wipe down including your refrigerator and the inside of your oven. My Favorite Kitchen Appliances for My GF Kitchen. In the last nine years, I have gone from having no-idea how to cook to being a pretty good gluten free chef (at least to my family). Along the way, I have picked up a few new appliances that I consider essential. I really believe in the simpler gluten free lifestyle and that carries over into my kitchen, so I don't have a ton of appliances. But here is a list of my favorite appliances that I would be sad not to have in my GF kitchen. Of course the two appliances we use most are our toaster and coffee maker. This is a list of "extra" appliances that will help in your GF cooking. I even listed them in order of importance to me. This may seem surprising but I use my mini processor as much as anything else in my kitchen. It is great for grinding up a quick topping for baked chicken fingers, some almonds if I need to make some almond flour, chopping up an onion, making chicken salad. It is something that I would really miss if I did not have it. This would be my second most favorite appliance. I love my KitchenAid Mixer. I use it at least five times a week for making everything from a quick batch of GF brownies to perfectly whipped mashed potatoes. I even shred Cheddar Cheese with an attachment. If you can afford it, you will not regret buying it. This appliance gets used 1 to 2 times a week depending on the season. It is great for whipping up some hummus or Thai peanut sauce. You can also make GF bread dough in a food processor. I love this little appliance that is all about speed and efficiency. We use it to whip up smoothies, make chicken salad, puree soup, and make a chocolate shake for dessert. It gets used 2 or 3 times a week. Popcorn is a pretty regular snack at our house so this get used a lot too. I even make it and put it in the kid's lunch boxes. You might be surprised that I put this one last. I think a bread maker is a nice luxury if you can afford it, but you can make bread without a bread maker. Having the bread maker simplifies the process - you just pour everything in and turn it on. If you have the time, you can be successful at making GF bread without a bread maker. READ OUR FULL REVIEW.